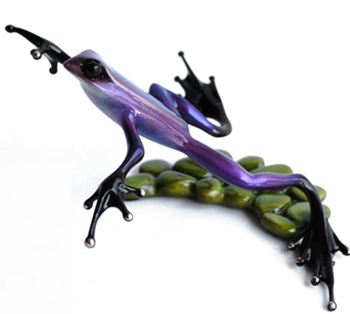 Cadberry, signed rare Frogman Bronze sculpture by artist Tim Cotterill. Westover Gallery are excited to add this wonderful, rare solid bronze frog sculpture to our collection. Cadberry is a brilliant purple patina bursting with personality. And Edition Variation of Stepping Stone in an edition size of just 100. Dimensions 4.5" x 4.25" x 2.5"